"THE QUICKER YOU SUCCEED THE BETTER"
Argentines "heard only what [they] wanted to hear." "If you can finish before Congress gets back, the better." 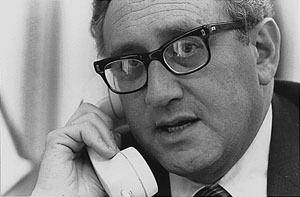 Kissinger to Argentine Generals in June 1976: "If there are things that have to be done, you should do them quickly"
Washington, D.C., 4 December 2003 - Newly declassified State Department documents obtained by the National Security Archive under the Freedom of Information Act show that in October 1976, Secretary of State Henry Kissinger and high ranking U.S. officials gave their full support to the Argentine military junta and urged them to hurry up and finish the "dirty war" before the U.S. Congress cut military aid. A post-junta truth commission found that the Argentine military had "disappeared" at least 10,000 Argentines in the so-called "dirty war" against "subversion" and "terrorists" between 1976 and 1983; human rights groups in Argentina put the number at closer to 30,000. The new documents are two memoranda of conversations (memcons) with the visiting Argentine foreign minister, Admiral Cesar Augusto Guzzetti - one with Kissinger himself on October 7, 1976. 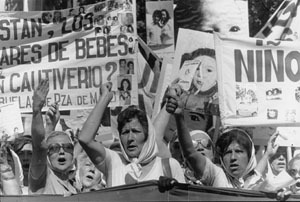 At the time, the U.S. Congress was about to approve sanctions against the Argentine regime because of widespread reports of human rights abuses by the junta. The memcons contradict the official line given by Assistant Secretary of State Harry Shlaudeman in response to complaints from the U.S. ambassador in Buenos Aires that Guzzetti had come back "euphoric" and "convinced that there is no real problem with the USG" over human rights. Schlaudeman cabled, "Guz;etti [sic] heard only what he wanted to hear." The human rights problem is a growing one. Your Ambassador can apprise you. We want a stable situation. We won't cause you unnecessary difficulties. If you can finish before Congress gets back, the better. Whatever freedoms you could restore would help." The problem is that the United States is an idealistic and moral country and its citizens have great difficulty in comprehending the kinds of problems faced by Argentina today. There is a tendency to apply our moral standards abroad and Argentina must understand the reaction of Congress with regard to loans and military assistance. The American people, right or wrong, have the perception that today there exists in Argentina a pattern of gross violations of human rights." Beginning in September 1976, the U.S. ambassador to Argentina, Robert Hill, had been pressing the Argentine military on human rights issues, amid a dramatic increase in the number of victims being disappeared, killed and tortured, including half a dozen American citizens. The Argentine generals dismissed Ambassador Hill's demarches, according to previously declassified cables written by Hill, and alluded to an understanding with high ranking U.S. officials "that the USG's overriding concern was not human rights but rather that GOA 'get it over quickly.'" had urged Argentina 'to be careful' and had said that if the terrorist problem was over by December or January, he (the Secretary) believed serious problems could be avoided in the U.S..." Wrote Ambassador Hill, "Guzzetti went to U.S. fully expecting to hear some strong, firm, direct warnings on his government's human rights practices, rather than that, he has returned in a state of jubilation, convinced that there is no real problem with the USG over that issue." A final note from Hill shows that the Ambassador was appeased by the strong response from Washington. "Your message on Guzzetti's visit was most helpful. It is reassuring to have chapter and verse on what Guzzetti was told. 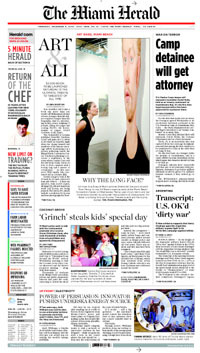 We will keep after him and other GOA officials," Hill wrote. There is no evidence that Ambassador Hill ever saw the actual transcripts of the conversations with Guzzetti included here. The two new memorandums of conversation (memcons) were not among the 4700 documents released in August 2002 by the Argentina Declassification Project of the U.S. Department of State. Much to the credit of Secretary of State Colin Powell and his predecessor, Madeleine Albright, who began the project, that release made front page news in Argentina, contributed dramatically to civilian control of the military, provided documentation on military decisionmaking now being used in dozens of court cases related to the "dirty war," and for some of the families of the "disappeared," gave the first available evidence of what had actually happened to their loved ones. The State Department project, however, did not included documents from the often-vigorous internal U.S. policy debates over Argentina; and neither the CIA nor the Pentagon participated in the declassification effort. The National Security Archive obtained the new memcons in November 2003 in response to a Freedom of Information Act request filed with the Department of State in November 2002, seeking to fill in the missing pieces from the larger release. In the following selection of documents, the memoranda of conversations Guzzetti had at the Department of State are preceded by two cables from Ambassador Hill reporting on the fruitless human rights demarches he had made to Admiral Guzzetti and President Jorge Rafael Videla in September, together with the contemporaneous Department of State intelligence analysis of the counter-terrorism practices of Argentine military, and the testimony of an American citizen tortured by the Argentine security forces. The torture report was written after an interview with the victim on October 4, 1976 by the same U.S. official, Fernando Rondon, who served as the notetaker at the October 7, 1976 Kissinger-Guzzetti meeting. Source: U.S. State Department, Argentina Declassification Project (1975-1984), August 20, 2002. In this cable, Ambassador Hill reported how his human rights concerns were also dismissed by the Argentine president. "[The] President said he had been gratified when FONMIN Guzzetti reported to him that Secretary of State Kissinger understood their problem and had said he hoped they could get terrorism under control as quickly as possible. Videla said he had the impression senior officers of the USG understood situation his govt faces but junior bureaucrats do not. I assured him this was not the case. We all hope Argentina can get terrorism under control quickly - but to do so in such a way as to do minimum damage to its image and to its relations with other governments. If Security Forces continue to kill people to tune of brass band, I concluded, this will not be possible. I told him Secretary of State had told me when I was in US that he wanted to avoid human rights problem in Argentina." Produced just a week before Argentina's Foreign Minister Guzzetti visited Washington, this analysis from the Department of State's Bureau of Intelligence and Research (INR) provides the baseline of U.S. knowledge about the Argentine military's counterterrorism activities and complicity in human rights abuses. There is no doubt that most, if not all, of the right-wing terrorists are police or military personnel who act with the knowledge and/or direction of high-level security and administration officials. They continue to act with an impunity that belies government denials of complicity. These factors do not absolve Videla of ultimate responsibility for the abuses. However, they point out the problems he faces in correcting the situation and suggest that the excesses are likely to continue until: --the security forces have reduced the subversive threat to what they consider to be an acceptable level; and --Videla feels sufficiently secure and strong in the presidency to assert his authority over free-lancing subordinates." They said they'd fix me so I couldn't have children." The document also points to the involvement of President Videla's intelligence service, Servicio de Informaciones del Estado (SIDE). 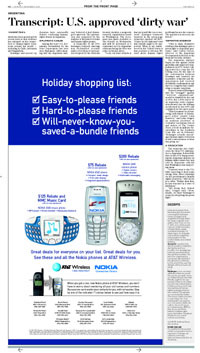 Source: Freedom of Information Act request by the National Security Archive, released November 2003. 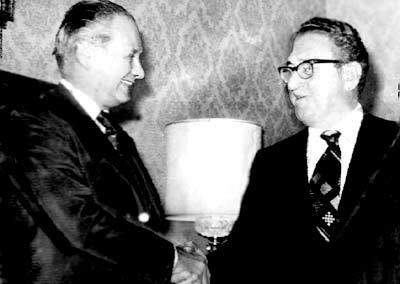 While Secretary of State Henry Kissinger was in New York, Acting Secretary of State Charles W. Robinson and Assistant Secretary of State for Inter-American Affairs Harry Shlaudeman received Argentine Foreign Minister Admiral Cesar Augusto Guzzetti in Washington. After Guzzetti described the situation in Argentina, Acting Secretary Robinson stated, "Argentina is now facing a kind of subversive civil war. During their initial period the situation may seem to call for measures that are not acceptable in the long term. The real question, he emphasized, is knowing how long to continue these tough measures and noted that the Foreign Minister had indicated that they might be required for another three or four months." "The Acting Secretary said that it is possible to understand the requirement to be tough at first but it is important to move toward a more moderate posture which we would hope would be permanent. It is helpful, he remarked, to hear the Minister's explanation of the situation. The problem is that the United States is an idealistic and moral country and its citizens have great difficulty in comprehending the kinds of problems faced by Argentina today. There is a tendency to apply our moral standards abroad and Argentina must understand the reaction of Congress with regard to loans and military assistance. The American people, right or wrong, have the perception that today there exists in Argentina a pattern of gross violations of human rights. Under current legislation the administration might be prevented under certain circumstances from voting for loans in the IDB, for example. The government is placed in a difficult position. In reality there are two elements that must be considered. First, how long is it necessary to maintain very firm, tough position? Our Congress returns in January and if there is a clear cut reduction in the intensity of the measures being taken by the Government of Argentina, then there would in fact be a changing situation where the charge that a consistent pattern of gross violations exists could be seen as invalid. Second, it is very important that Argentina find a means to explain the Argentine position to the world. There is also a third element and that is that there are many well meaning people in the United States, though perhaps somewhat naïve, who indiscriminately take the side of those imprisoned in Argentina. Their attitudes are reinforced by instances where the U.S. government has been unable, in the case of arrested U.S. citizens, to have consular access. The U.S. is not going to defend these persons if they break your laws but we must have prompt consular access." "In summary there are three issues: the question of timing of the relaxation of extreme countersubversion measures; promoting an understand [sic] of the problems facing Argentina; and consular access." "Foreign Minister Guzzetti: The terrorist organizations have been dismantled. If this direction continues, by the end of the year the danger will have been set aside. There will always be isolated attempts, of course." "The Secretary: When will they be overcome? Next Spring?" "Foreign Minister Guzzetti: No, by the end of this year." "The Secreatry: Look, our basic attitude is that we would like you to succeed. I have an old-fashioned view that friends ought to be supported. What is not understood in the United States is that you have a civil war. We read about human rights problems but not the context. The quicker you succeed the better." "The human rights problem is a growing one. Your Ambassador can apprise you. We want a stable situation. We won't cause you unnecessary difficulties. If you can finish before Congress gets back, the better. Whatever freedoms you could restore would help." Admiral Guzzetti had just returned from the U.S. and Ambassador Robert Hill wrote what Assistant Secretary of State Shlaudeman termed "a bitter complaint" to Secretary of State Henry Kissinger protesting that the Argentine military were not receiving a strong disapproving signal from Washington for their human rights violations. Hill wrote that the Embassy was now in an awkward position to present demarches on human rights and protest the treatment received by American citizens. In this memo Hill wrote that "[Guzzetti] spoke first of his lunch in Washington with Deputy Secretary Robinson, Assistant Secretary Shlaudeman and Ambassador Martin. He emphasized how well they understood the Argentine problem and said that 'the consensus of the meeting was to [unintelligible] the terrorist problem as soon as possible.'" had urged Argentina 'to be careful' and had said that if the terrorist problem was over by December or January, he (the Secretary) believed serious problems could be avoided in the U.S...."
"Guzzetti's remarks both to me and to the argentine press since his return are not those of a man who has been impressed with the gravity of the human rights problem as seen from the U.S. Both personally and in press accounts of his trip Guzzetti's reaction indicates little reason for concern over the human rights issue. Guzzetti went to US fully expecting to hear some strong, firm, direct warning of his govt's human rights practices. Rather than that, he has returned in a state of jubilation. Convinced that there is no real problem with the USG over this issue. Based on what Guzzetti is doubtless reporting to the GOA, it must now believe that if it has any problems with the U.S. over human rights, they are confined to certain elements of Congress and what it regards as biased and/or uninformed minor segments of public opinion. While that conviction lasts it will be unrealistic and unbelievable for this embassy to press representations to the GOA over human rights violations." "Bob Hill has registered for the record his concern for human rights in a bitter complaint about our purported failure to impress on Foreign Minister Guzzetti how seriously we view the rightist violence in Argentina (TAB 2)"
Assistant Secretary Harry Shlaudeman responded to Ambassador Hill on behalf of Secretary Kissinger: "As in other circumstances you have undoubtedly encountered in your diplomatic career, Guz;etti [sic] heard only what he wanted to hear. He was told in detail how strongly opinion in this country has reacted against reports of abuses by the security forces in Argentina and the nature of the threat this poses to argentine interests." "Your message on Guzzetti's visit was most helpful. It is reassuring to have chapter and verse on what Guzzetti was told. We will keep after him and other GOA officials." "At the same time we continue to believe many in GOA maintain their illusions GOA has no serious human rights problems, and Guzzetti's behavior since his return has done nothing to change their views. Presentation of protest by department should be most effective way, at this point, of reinforcing message Guzzetti got in Washington."